In the vast darkness, between the roots of Yggdrasil, sits Nidhogg. Yggdrasil is the three of life, according to Nordic mythology. It is a three that reaches up till heaven and lives forever. 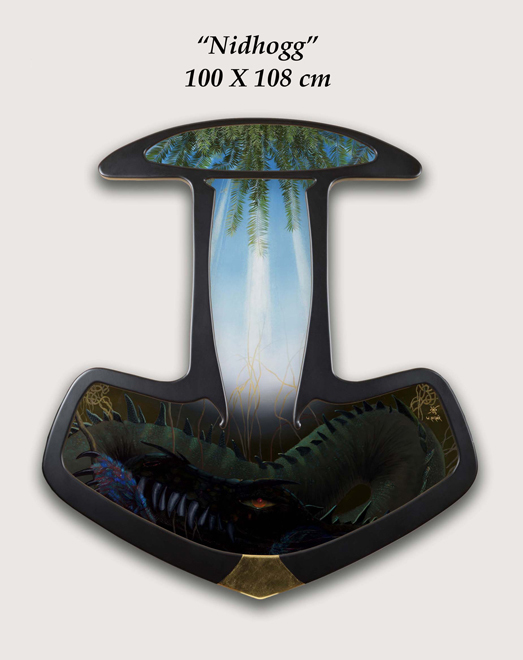 Nidhogg has been painted here in the shape of a socalled brakteaat, a charm that was popular in ancient Germany. Often dedicated to Thor, this time, in this painting, to Nidhogg. As for Nidhogg, that’s the name of a dragon that constantly gnaws at the roots of Yggdrasil, according to German mythology and described in the Icelandic Edda. Experts in this matter do not all agree in what exactly could be the symbolic meaning of this story. As a layman I’d say that all things that we humans consider to be “good”, constantly live under a threat of evil forces. But because the roots of Yggdrasil grow back all the time, everything stays balanced. Metaphorically speaking, this is a perfect image of human life as it is: nothing ever stays the same, but over time, things stay in balance. So we can say that the dragon symbolizes disaster, hunger, death and diseases. All this, according to Jackson Crawford, a renowned translator of old Nordic poems. So Nidhogg is feminine and feathered., would it be possible that the writers of the ancient poems attributed some kind of attractiveness to danger?